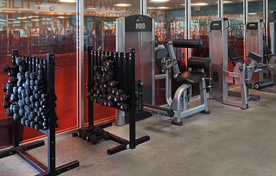 Get your workout in gear with free weights at the Ellis Athletic Center in Newtown Square. In addition to dumbbells of varying weights, our gym also features incline press bench, decline press bench, straight bars and more! For a really rugged workout, combine your free weight exercise with strength training. Our Newtown Square health club features a dedicated weight room with single-station, plate-loaded and selectorized Life Fitness and Hammer Strength equipment. Stop by for a free, 3-day trial membership and pump up your physical fitness program today!